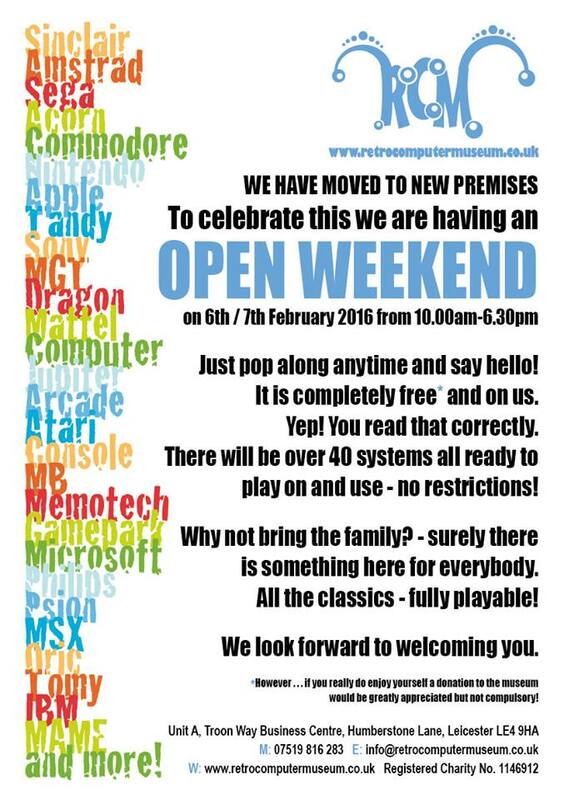 A popular Leicester museum specialising in the history of computing has moved – and is celebrating with a special Open Weekend this Saturday and Sunday! The move, which is something of a ‘quantum leap’ for both the Retro Computer Museum and its staff alike, is to more spacious premises nearby, and reflects the success of the fast-growing establishment, whose volunteers are often to be seen showing off some of the stars of the Museum’s collections at retro events up and down the UK. The Museum, which transferred its vast number of exhibits, plus furniture, equipment and storage, from its previous accommodation at the Troon Way Business Centre in January, now has more room to breathe at Unit A of the Humberstone Lane centre – thanks to the sterling efforts of volunteer staff and supporters. Congratulations are therefore now due – and to celebrate the move, the Museum is holding an OPEN WEEKEND on Saturday 6th – Sunday 7th February 2016, from 10am-6.30pm. Their main focus is on systems that were in use in the home, rather than big computer systems and mainframes of early computer development. Accordingly, they have systems ranging from the early Pong consoles through the Sega and Nintendo console wars and the home computers of the ZX Spectrum, Commodore 64s and Amigas. The RCM aims to provide Retro Gaming and Computing events and access to retro computer equipment for educational visits and tours. The Retro Computer Museum has held seven Retro Gaming events of its own to date, including partnership events with Snibston Discovery Museum. The Retro Computer Museum has also made appearances including the 2010 Vintage Computer Festival in Bletchley Park, Recursion 2015 and participating in the 2010 EuroCon event in Manchester with a line-up of British computers. The Museum is a fascinating and friendly place, and a worthy cause for your donations of old hardware, software, books – and perhaps a little cash to help keep things going! So if you really do enjoy yourself there this weekend (and we’re sure you will) a donation to the museum would be greatly appreciated – but is not compulsory. Retro computing fun from RCM at Snibston! Our friends at the wonderful Retro Computer Museum in Leicester are coming out of their shell next month for another fun for all the family foray to the Snibston Discovery Museum in Ashby Road, Coalville. Acorn, Sony, Amstrad, Atari, Commodore, Ninetndo, Sega, Sinclair, Dragon, Apple – and of course some other, rarer kit! Also, as part of the great value ticket price (see below) you can also explore the Snibston Discovery Museum – the region’s largest science and technology museum. The event opens 11am-5pm on Saturday 20 June and 10am-4pm on Sunday 21 June. Advance tickets can be purchased from the venue up until the day before, or via the ‘Donate’ button on the Retro Computer Museum’s Home Page – please state what days and the ticket type you are purchasing in the comments box – until Thursday 18 June 2015.